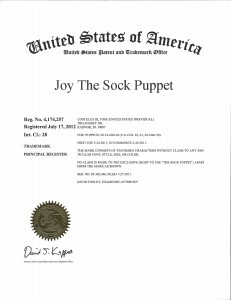 Joy The Sock Puppet now has her own trademark! Joy The Sock Puppet® now has her own official trademark!! The United States Patent and Trademark Office (USPTO) issued registration number 4,174,257 on July 17, 2012. She is pretty excited about this and will probably celebrate by getting her hair done! She is also getting ready for her series of videos about the plight of the homeless. They should be ready in the fall. And maybe in September Joy will get to meet a really really famous puppet in person. Can you guess who that might be? Think tall. Think yellow. Think bird. ← Shop online. Automatic donations to The Joy of Sox with iGive.